With BlackBerry 10 all set to launch in a little over two weeks, the leaks are really springing, and so far it's all good news. The latest suggests that Twitter and Google Talk will be integrated directly into the BB10 OS, right in the BlackBerry Hub - the system's unified notification center and inbox. Additionally, Canadian phone makers Research in Motion (RIM) recently held a "port-a-thon" event to get as many apps ready for the BlackBerry 10 launch as possible. The turn out? More than 15,000 BB10 apps were submitted in under two days. The bad news is that not all of those apps will be approved, of course. But still, a good chunk of them likely will, and BlackBerry 10's launch is looking better and better. And all it took was money; the port-a-thon event offered app developers $100 (UK£62, AU$94) for every BlackBerry 10 app that gets approved. 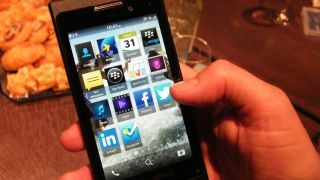 The stunt could potentially cost RIM $1.5 million (around UK£932,000, AU$1.42 million), though the presence of so many apps at launch could make it worth it. But that's not all. App devs who submitted between two and five apps had a chance to win a BlackBerry PlayBook, and those who submitted more than five were up for BlackBerry 10 Dev Alpha units. The other leak that emerged on Monday exposed the integration of Twitter and Google Talk directly with the BlackBerry 10 OS. In fact, screenshots that Engadget said are "quite legit" show the two apps listed right next to Facebook and LinkedIn in the unified BB Hub. More BlackBerry 10 leaks are expected in the coming weeks, and there have been plenty already. Most recently, a RIM executive claimed that BlackBerry 10 devices are going to cover all price points, all the way from cheap to less-cheap and beyond. Prior to that, BB10 keyboard details and browser test results (it's speedy) emerged as well. BlackBerry 10 won't have an easy time catching up to iOS, Windows Phone and Android, but with the way everything's looking so far it might just have a chance.